"Both of Exeter's away wins have come by no more than 12 points and the in-form visitors could be set for another tight victory." Exeter are showing no signs of dropping the pace this season with the Chiefs winning all five Premiership matches. 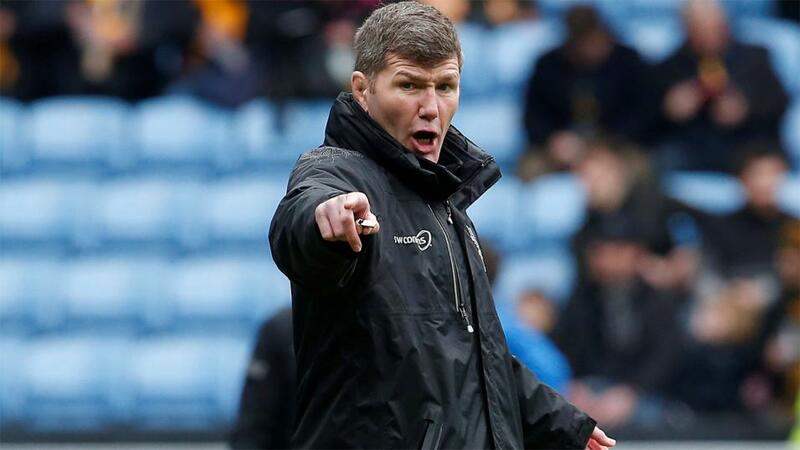 Rob Baxter's side started with a 40-6 drubbing of Leicester and last year's finalists have continued their momentum over the last month. Exeter claimed a comfortable 28-11 home win over Worcester last weekend. Bath have had mixed fortunes this season with Todd Blackadder's side again displaying the inconsistency which has frustrated them in recent years. The decision to rotate the squad last week was understandable, to a degree, with Saracens running out convincing 50-27 winners. Bath have yet to lose at home though after a 31-31 draw against Gloucester and a 17-15 victory over Northampton. Exeter are in superb form and there is no sign yet of any team halting their progress. The Chiefs will be confident of making it six successive victories this weekend at the Rec. Both of Exeter's away wins have come by no more than 12 points and the in-form visitors could be set to claim another tight victory. Northampton endured a horrendous season last year and are in the process of rebuilding the team under new director of rugby Chris Boyd. The Saints have unsurprisingly been hit and miss so far with two wins and three defeats. Northampton got off the mark away at Bristol in their 45-40 victory last week but Boyd was not overly complimentary with his side's performance. Leicester also have their own problems to deal with and interim boss Geordan Murphy is setting about the task of reviving the fortunes of the Tigers. It really has been the good, the bad and the ugly so far with Leicester suffering a thumping defeat at Exeter, a shock defeat at home to Worcester and most recently edging to a 19-15 win over Sale on Sunday. With the game being played at Twickenham, Northampton could hand away any advantage they had which may play into the hands of their opponents. Leicester have so much big game experience, even if their current side is not a vintage edition, which could give them the edge at a neutral venue. Neither team is playing with a huge amount of confidence but Leicester look worth backing to gain a victory against their fierce rivals. Harlequins have displayed some promising signs under new boss Paul Gustard although consistency has been missing this season. Quins clinched a dominant opening win over Sale before stumbling to three consecutive defeats. Harlequins responded strongly last weekend at Kingsholm with a 27-25 victory over Gloucester getting the team back on track. Saracens have been virtually flawless this season with the champions recording five bonus-point wins. Mark McCall's team have been closely tracked by Exeter but Sarries have been majestic in the opening month. The Men in Black eased to a 50-27 home win over Bath last weekend with Liam Williams scoring a hat-trick. This looks a very tough ask for Harlequins against the Saracens juggernaut and the visitors should maintain their winning start to the campaign. Both of Sarries' victories on the road have come by 11 points so there is no guarantee of a big away win. It could be worth backing the league leaders to prevail again by up to 12 points this weekend. The final game of the weekend could be seen as a relegation battle with the two pre-season favourites for the drop facing each other. Worcester have only won one of their opening five matches which came in unexpected circumstances after a stunning 44-37 win at Leicester. The Warriors lost 28-11 at Exeter last week but will know this fixture is much more critical to the chances of retaining their status. Bristol have certainly not looked out of place following their promotion to the Premiership. Pat Lam's team made the ideal start by defeating Bath at home in their first match before edging to a 20-13 victory over Harlequins recently. The Bears have been competitive but were pipped last weekend in a thrilling 45-40 home defeat to Northampton. This match could be settled by fine margins but home advantage may be enough to tip it in favour of the Warriors. Worcester have come close to winning at home with slender defeats to Wasps and Newcastle but this looks a big opportunity to get off the mark in front of their fans. It would be a surprise if either side wins easily though and a narrow victory looks the likeliest outcome for Worcester at Sixways.